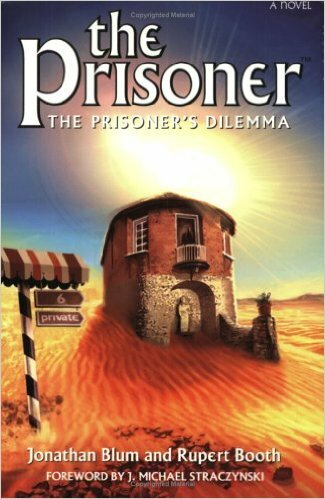 THE PRISONER'S DILEMMA Review | Warped Factor - Words in the Key of Geek. The 1967 series The Prisoner has left quite a mark on pop culture. Lasting a mere seventeen episodes, the unusual mix of genres ranging from spy thriller to dystopian to political satire with dashes of psychedelic thrown in has guaranteed it its status as “cult TV” icon. Yet beyond those episodes and a handful of books (including the graphic novel Shattered Visage published by DC Comics in 1989), there has seemingly been little else to come out of the series. That looked to change in 2005 when Powys Media published The Prisoner's Dilemma and launched what looked to be an ongoing series of books. Sadly this was to be the only widely distributed novel to date from the company but it makes from fine reading more a decade after its initial release due to its own intriguing mix of elements. Jonathan Blum and Rupert Booth's novel is an excellent example of what good media tie-in writing is capable of. On one hand, it delivers the flavor of the original series perfectly. Blum and Booth captures the mercurial Number Six perfectly throughout the novel's 330 pages, something difficult to do given just how much of a stamp McGoohan made on the role. The novel's plot echoes elements from a number of Prisoner episodes, including Chimes Of Big Ben and The General, while also finding ways to reference other episodes in a series (in)famous for the debates over which episodes go where. Indeed the novel, perhaps by being able to paint across a broader canvas, gives the reader some real idea of what it must be like to live in the Village where it can be the same day of the week for days in a row and you can't really tell friend from foe. As a pastiche of the TV series, it's a fine piece of work. Yet Blum and Booth go beyond just simply doing a pastiche of the series. While the plot may echo elements from a number of TV episodes, this is a story that would not have been told in the TV series. Why? Because all works of “art” are invariably products of the time they're created in and this is a tale that is very clearly written in and for the world we live in now. There are issues of computer technology (including the rather surprising appearance of a certain noted historical figure), surveillance, reality TV shows like Survivor and Big Brother, celebrity culture and exactly what length is too far to keep “the people” safe. They're all issues explored in fascinating but entertaining ways, yet they never feel forced. To Blum and Booth's credit, they manage to make those issues so familiar to those of us living in a world after 9/11 and integrate them seamlessly into the world of a TV series made nearly a half century ago. Or, perhaps, it just speaks to how timeless the original TV series was that more modern elements can be worked into it. With all of that, The Prisoner's Dilemma has an interesting feel to it. This doesn't feel like a sequel to the series or an attempt to make a “lost story” from it. Instead this feels not like a single episode but like a whole mini-season built somewhere into the series as a whole. It's at times as much a reinvention of the series as a pastiche of it, something which makes reading it all the more interesting. Perhaps as a result, Blum and Booth created a Prisoner tale unlike any other. It's a work that serves to do a first rate pastiche of the series right down to capturing its mercurial lead character. Yet it also does an expansion of the TV series, creating a story that works to explore modern issues in the context of a TV series viewed by so many as being ahead of its time. For all of that, it might just be the best non-TV Prisoner work out there that's based on the original TV series.